We are moving through the changing of the guard. This is because we ordinary humans are changing. We are choosing what is really good for us rather than what we’re told is good for us by people who don’t necessarily have our best interests at heart, or whose education limits them to conventional drugs and chemicals. We are individually and collectively beginning to find our own truth to often be more valid than that which is offered by the ‘experts’. As Catherine learnt to her dogs’ cost, it is up to us animal guardians to satisfy ourselves that what we do in the name of love is helpful, and not harmful. Therefore we pet owners need to take responsibility for those in our care, and we need knowledge. In The REAL Epidemic, Catherine is inviting you to join the healthcare revolution and become a powerful animal owner, armed and equipped to protect your friends against the world. Taking you through the workings of the immune system and the man-made products that are doing a good job of destroying it, Catherine explains what is happening, specifically, when your dogs get specific allergic and autoimmune disease, as well as cancer. Understanding this, armed with knowledge of many healing herbs and foodstuffs, you will know how to (God willing) prevent these diseases in the first place, and how to actively help your own animals to heal. It’s time for us to step up and become our own experts. This is the beginning of the most amazing healing journey for you and your loved-ones. Catherine O’Driscoll’s latest book is a brilliantly researched, wide-ranging, and comprehensive treatise on canine health and disease. This book is a deeply scientific and respectful expose of the causes of so much ill health and suffering in the modern dog. 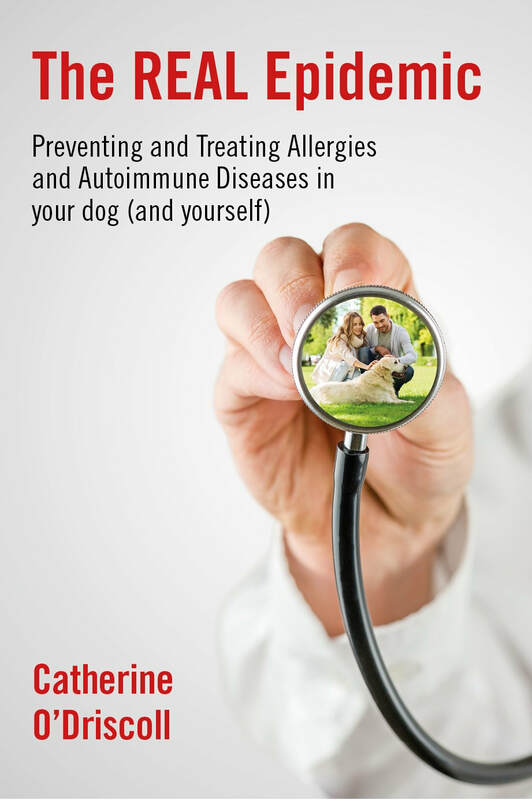 Catherine’s easy to read style, combined with her well researched and up-to-date scientific information, deserves to be understood and digested by anyone who has a genuine interest in fostering their own health and the health of their canine companions. In fact, Catherine’s book is a “MUST READ” for anyone who is concerned about the pandemic of health issues suffered by today’s canine family members - and that includes ALL members of the Veterinary profession. This book makes an ideal present for Dog owners, Dog Breeders, Dog trainers… in fact anyone who plays any role at all in the world of Dogs. If this book were to become required reading for every undergraduate and newly graduated veterinarian, we could look forward to a time, in the not too distant future, when there would be far less canine suffering.